It's Hell Week. Near and far a storm is brewing. Over the weekend, the HudCo Machine worked itself into a frenzy as its competing factions enter a feverish pitch to control the local party machinery and "The Line." Over the weekend, the political activity escalated. Union City Mayor Brian Stack sent his army down the hill to visit Hoboken Democratic Committee members in a late bid for their votes set for Tuesday night in Kearny. Both Brian Stack, who doubles as a NJ State Senator, and Mayor Ravi Bhalla are in a desperate battle for political power, political control and their political ambitions. Both placed last-minute phone calls over the weekend to Hoboken HDC members trying to wrest their vote. Alternatively, Jersey City's Amy DeGise, who is vying to be the first female Democratic County Chair in Hudson County history, came to the Mile Square City seeking out HDC members and their votes. Lots of shots, counter shots and cheap shots with the Mile Square City ground zero for an election that doesn't get more insider than this. Last week, Stack showed Ravi Bhalla how a machine boss gets it done. He closed the Union City schools on Tuesday so he could leverage the public school teachers and BoE staff to invade West New York in a bid to influence votes for its Democratic Committee Seats there on Election Day. The effort backfired badly and Saturday he reopened the schools as a makeup day. Your turn Ravi. On the downside, Brian Stack is fending off severe criticism for crossing party lines and endorsing former governor Chris Christie for re-election in the very partisan highest elected office in the state. In addition to his 2013 endorsement for Christie, Stack called him the best governor "we've ever had" and declared he is never about party. Amy DeGise has been repeating those Brian Stack talking points to everyone who's listening. She's lambasting Stack for his bipartisanship pointing to the Hudson County Democratic party bylaws where such allowances are impermissible. Christie the best governor in the history of NJ. 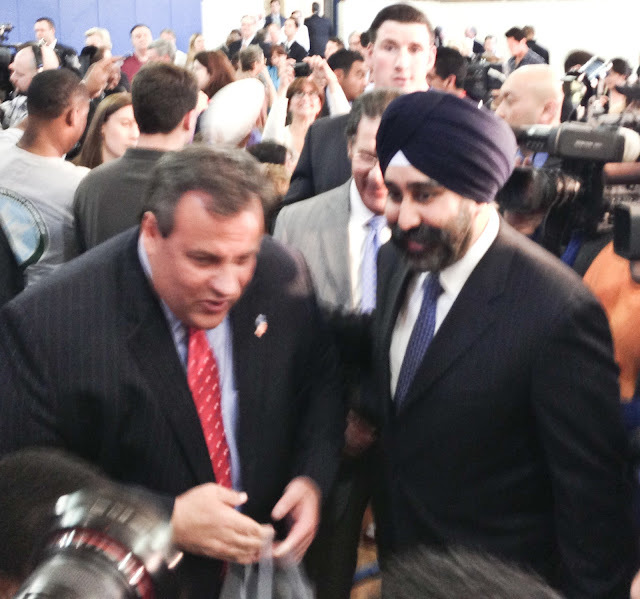 Ravi Bhalla also stood shoulder to shoulder with Chris Christie that year when it was the politically advantageous and expedient thing to do. 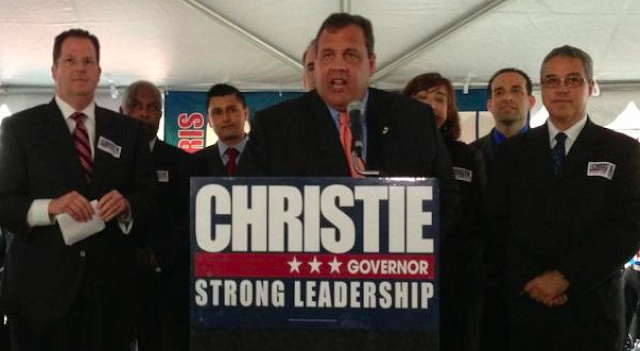 Christie was friendly with him and they appeared together at an NFL event at the Hoboken Boys & Girls Club. The backbiting will see barbs tossed back and forth right up until the voting machines are opened Tuesday night. With the committee votes lost in much of Bayonne and West New York to Amy DeGise, Hoboken becomes one of the hotbeds for last-minute electioneering. For Ravi Bhalla, the hijack of the HDC after having Councilwoman Tiffanie Fisher booted for aligning with a liberal Republican candidate in a non-partisan municipal race is coming face to face with him joining the Stack rebellion. Bhalla pushed all of Hoboken's chips into the middle of the table looking to politically advance himself. Now the cost will be weighed against both with tomorrow's final vote for Hudson County Democratic Chair. Back in 2013, then Councilman Ravi Bhalla spent some quality time with former governor Chris Christie who was visiting Hoboken for a NFL event promoting youth fitness at the Hoboken Boys & Girls Club. Somewhere, Stack's rival "Uncle Nick" Sacco, a dual officeholder himself as Bergen City mayor and NJ State Senator is smiling amid all the mayhem. County Executive Tom DeGise is beaming with anticipation his daughter may break the HudCo glass ceiling and oozing confidence. Hoboken can sit back, smile and bend over. The HudCo Machine and its self-absorbed pols will take care of the rest. Related: Team Stack with Ravi Bhalla and Steve Fulop are behind a lawsuit complaining about procedures in the HCDO election before the election even takes place. County Executive Tom DeGise sees it as a prelude to more legal whining after Tuesday as reported in the Jersey Journal.